Every month, I’m slathering, tapping, swiping and scrunching a slew of beauty products as part of my job as beauty editor for Composure Magazine, and this past month has been no exception. In Composure‘s latest issue out now (buy it here), I narrowed down the prettiest spring-inspired beauty products for my Editor’s Picks story, slathered my dried-out locks with conditioning foams, tapped on the newest technology in base that let’s your skin shine through (but not your sunspots), mattified my lips, tin-foiled my sheet mask, and applied liquid liner from a cushion. And through it all, I discovered products I never knew I couldn’t live without and new favorites that will sit prettily at the front of my vanity. 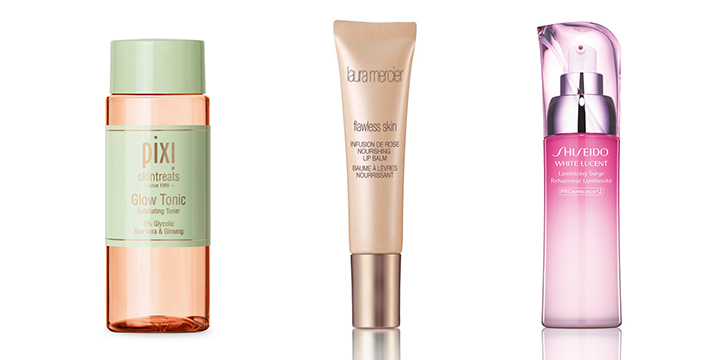 Read on to see what new must-haves you’ll want for spring. I had heard about Pixi, that skin care line you find at Target, but I hadn’t heard about it. That is, until I went to a Pixi Skintreats press event, and everyone was going on and on about “Caroline.” Caroline? I asked? Caroline who? It took me a few tries to get her last name. Caroline Hirons, said the PR girl, like she was saying Gwen Stefani. Thankfully, she didn’t roll her eyes at my ignorance because, as I was to later find courtesy of Google, Caroline Hirons (whose illustriousness is evidenced by her website, which is simply her full name) is the reason why every other skin care ‘grammer, whose posts consist solely of hazy bottles of product lined up without any pretense of artistry or photographic acumen, invariably includes the peach and mint hued plastic bottle of Pixi Skintreats Glow Tonic. Caroline raved about it once — and the entire stock of Glow Tonic sold out worldwide. So of course, I was excited to try this magic potion. It’s a 5% glycolic acid toner that goes for the shocking price of $15. It smells good, it’s pretty to look at, and I feel good knowing I’m exfoliating, not too harshly, but just enough every day to keep my pores under control and boosting skin cell turnover. This has been my gateway drug into acid toners — I’ve recently purchased Cosrx’s BHA toner for my T-zone and plan on keeping a glycolic acid toner in my already bursting-at-the-seams skin care regimen. If you haven’t incorporated a glycolic toner into your regimen (Pixi’s is currently sold out on Target online, but they have it available at Pixibeauty.com), this a good one to start with. Which brings me back to Shiseido. Their brightening line of products, called White Lucent, is now, they say, formulated without any alcohol. (It’s actually surprising how many Asian prestige brands use alcohol in their formulations.) They’ve even changed up the packaging to a very cheery hot pink. The Luminizing Surge is an emulsion, which you use after your serum as a light moisturizer (I always finish with a heavier face cream to lock everything in), and it targets dark spots with vitamin C, their patented 4MSK brightening ingredient, white lilac and Bulgarian rose oil (it smells faintly of roses, too, which is heavenly). 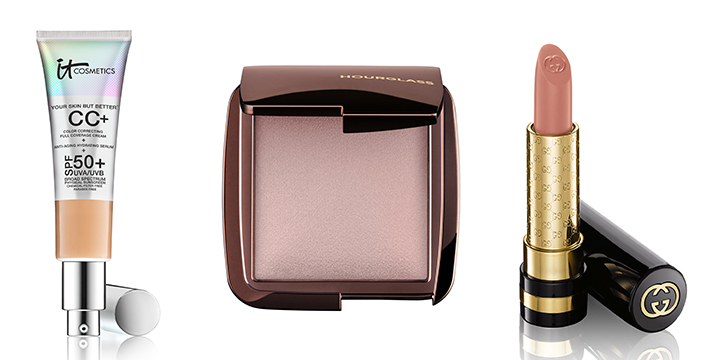 Another rose-scented lovely is Laura Mercier’s Infusion de Rose Nourishing Lip Balm. Now, I’m not a fan at all of scented lip balms or lip products — I don’t know if it reminds me too much of those disgustingly gooey (and gooey smelling) Lipsmackers as an adolescent or if I just don’t like things that smell like food to be so close to my tongue and not actually be food. But this not-at-all-gooey, super-softening treatment (I’d hardly call it a waxy, slippery balm) not only smells just enough like roses to be pleasing but it really does hydrate my lips. (It should — it’s got four different vitamin- and antioxidant-rich seed oils: rosehip, sunflower, kukui and macadamia.) I keep it on my desk next to my Clarins Lip Comfort Oil (I stash these everywhere, they’re so good) and my La Mer The Lip Balm (yes, more like a traditional balm, but soooo good on the lips) just so I can decide what to apply depending on my mood. I’ve tried a lot of BB creams in my day, but there are only a few that meet my requirements of coverage, smooth application and correct shade. Coverage is especially difficult since the often limited range of shades in BB creams means that if coverage is good, you end up with a thick, ashy look. I like Shiseido’s BB cream (though the tube is infinitesimally small), and my mom and I both love Amarte’s BB cream. Another one that is consistently good is IT Cosmetics Your Skin But Better CC Cream with SPF 50+. Yes, it’s on the thick side, but it melts in pretty fast and the coverage is excellent. It’s even got serum-worthy ingredients, including snail mucin. One fairly new brand I have to say I’ve been quite impressed with is Hourglass Cosmetics. I was first introduced to its Immaculate Liquid Powder Foundation for my oil slick of a T-zone, and while it’s difficult, I find, for a color product to really control out-of-control oil (for that, I need to be super diligent with my clay masking, and even then, the benefits only last a day or two), this foundation has been my go-to for my T-zone. It doesn’t sink into pores, imparts a nice, matte finish, and I don’t have to do too much touching up other than soaking up excess sebum with oil blotting papers. And speaking of appealing to the aesthete in me, I can’t get enough of Gucci’s Luxurious Moisture-Rich Lipsticks. The tiny double G’s, the black and gold packaging, the perfectly branded lipstick bullet — it’s a shame to actually have to use it, but at least I’ll feel glamorous pulling it out to touch up my lipstick. 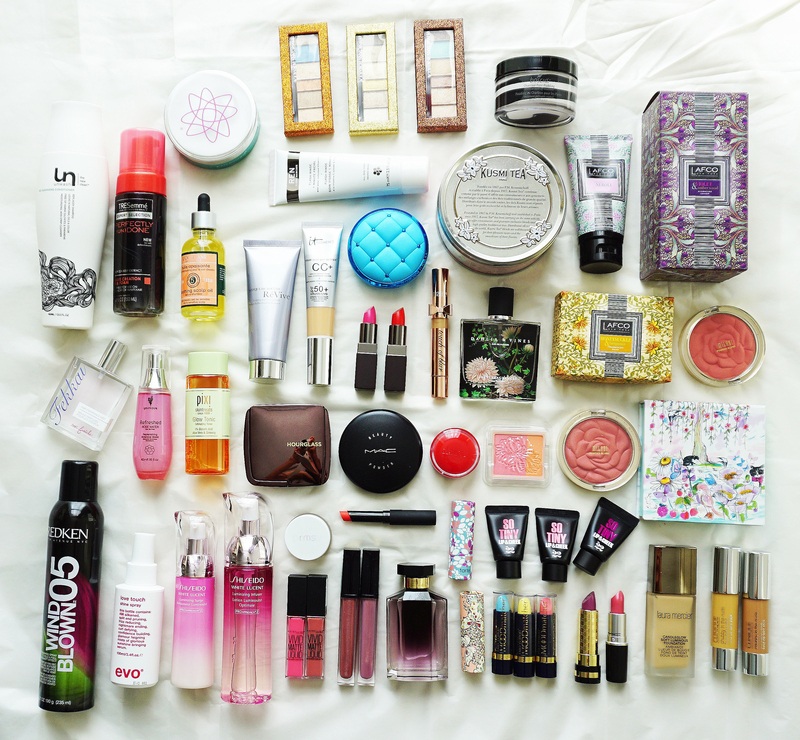 Coming up, more discoveries from my life as a beauty editor.